So what, exactly, is a robotic psychiatrist? Coining the term the ‘World’s First Robotic Psychiatrist’ in 1986 was Joanne’s tongue-in-cheek way of illustrating our civilization’s movement toward a time when intelligent and sentient robots are so much a part of our daily lives that we become emotionally attached to them. And, as we do with our pets which we often humanize, when our robots adapt and display our own perceived emotions, neuroses, and more, we may have to take our robots to a ‘shrink’ to adjust their behaviors and responses to us humans. More than that, a Robotic Psychiatrist concerns herself with how robots can benefit humanity as well how humanity will affect robots. Dubbed by Isaac Asimov himself in 1989 as the real Susan Calvin, a robopsychologist depicted in his 1950 short stories collection, I Robot, Joanne brings Susan Calvin to life with a bit of a modern twist. ‘Robotic Psychiatry’ while it touches upon the subjects of artificial intelligence (AI), human/robot interaction, etc., is still a humorous and entertaining medium intended to bring awareness, integration, and acceptance to a society in which there tends to be a constant undertone of disbelief or distrust when it comes to the topic of robotics. Human beings will need to learn to live with robots, but more importantly, robots will have to acclimate to living with us. For three decades, Joanne has seen the inevitability of this level of interaction, and she’s been working toward a way to use robopsychology to successfully introduce our robotic partners to the reality of the human condition. Once society has accepted that in our foreseeable lifetime, the world will be as dependent upon robotic technologies as it is on computers today, the complex and controversial topics of robotic psychiatry such as robot law, robot ethics, and where to take our robot when it suffers from sibling rivalry, will be more compelling. 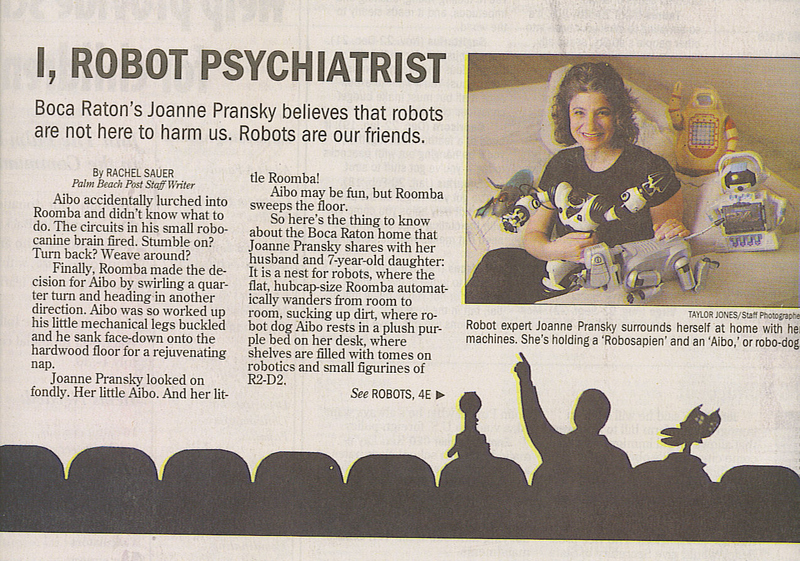 So what, exactly, does a “robotic psychiatrist” do? The world of robot related technologies is vast and complicated. It’s also unbelievably fascinating, not to mention an inevitable part of our future. As we rapidly move into the stage of civilization where AI and personal robots are far more reality than science fiction, the need for someone to act as a bridge between worlds is ever-present. As the World’s First Robot Psychiatrist, Dr. Joanne – who already saw the shape of our future as far back as the late 1970s while studying human development at Tufts University – wants to work on paving the way for human-robot interaction, and she wants to do it by focusing on the robots’ side of things. With a combination of humor, psychology, and futurism, Joanne aims to help the general public understand that AI and robotics are a certainty. In an effort to educate and increase the public’s awareness about current robotic developments, Joanne’s mission has been to bring real robots onto the widescreen, interacting with people in new environments. Seeing real robots in action – both what they can and cannot do – is more of an impact than plain ‘believing’ – it’s step one toward acceptance, and the best way to prepare and integrate a society. To see Dr. Joanne in action, visit her YouTube channel to view her engaging with various patients.